My user name “aclassifier” (or “Aclassifier”) is a pun that originates from my experience with collecting and describing (“classifying”) my first-generation short-and-tall Mercedes-Benz A-Class scale models. The result of this attempt is still to be seen here. Then, A-Class’ifiers became aclassifier. I have used that name whenever there was a need for one. Nowhere has this information been classified! My “classic” home page (since 2000) is at www.teigfam.net/oyvind/. I certainly update it. Like the page about me here. But it’s here the action is. This blog is all about all my attempts with that broken saw (it’s always starting out as difficult, the saw is not cooperating!) and then how I, after having tried long enough show what I’ve come up with. I am not starting up as an expert on anything, so I try to also show the paths I walk. This header image is from the inside of Torre del’Orologio (Torre del Candeliere or Torre dell Orologio) in Massa Marittima in Italy. The picture is not edited in any way, but the clockwork is indeed inside a glass box. 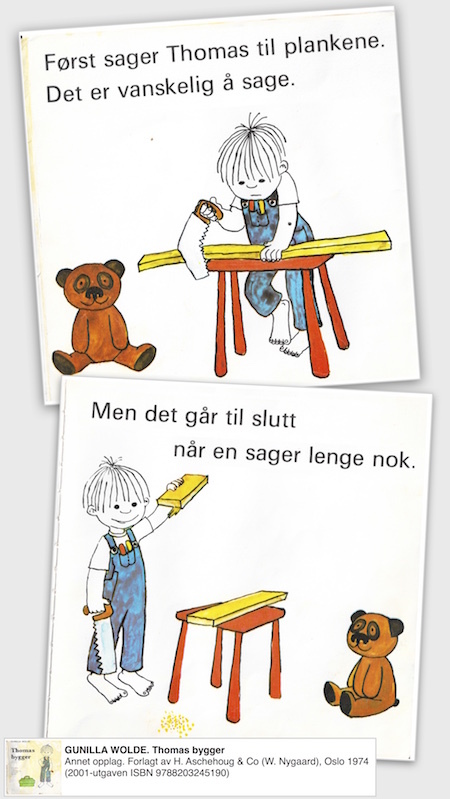 It is the basis for one of the stories in my short story book Og der sto, du (in Norwegian). This header is a close-up of a bouquet of flowers. Believe me, the gerbera flowers are orange, and the flower vase has the form of a cone all the way down. (The vase is by ceramist Asbjørn Pettersen. I bought it in Mandal, Norway). This header’s idea is to show the graduated scale of the world’s first “voltmeter”, as seen at the The Volta Temple in Como in Italy. It is a “straw condenser electrometer in square bottle” or electroscope (as earlier built by Cavallo and Bennet) – but this time with a graduated scale, so it’s the first electrometer (displayed as item “305” at the museum; it’s an original from Volta’s hands). The pendula (arrow) are two straws, as the title suggests. I found this mechanical counter at a second-hand shop here in Trondheim, shown here without its hood. On this odd architecture (for my purpose) of five non-connected three digit counters I had to press 1025 times to display those 8 digits. With a specialised arrangement with three counters and 2+2+4 digits I would have needed only 26 presses. But this arrangement of iron plus added colour would never feel days go by. No matter how much fancy iron we added. My wife Mari and I went, as we often do, for a walk along the river running through Trondheim. This anchor ball got my attention, as river Nidelva tried at its best to carry it downstream. 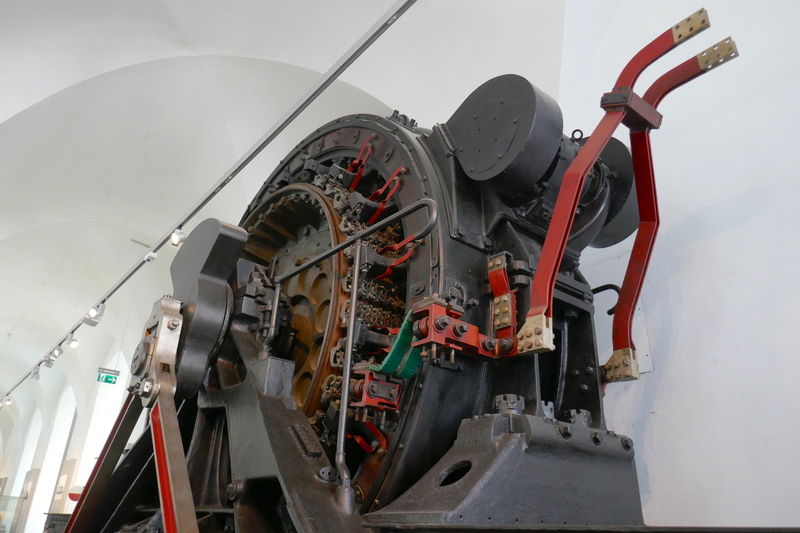 I visited Verkerhs Museum Dresden (Dresden Transport Museum) in August 2018 and discovered this electric motor of 2400 kW. The E52 42 loco from 1926 is no more, but this is claimed to be the world’s most powerful electric motor for locomotives. I used a long time to feel it, enjoy it, be overwhelmed by it. In some way it reminds me of what my father Hans-Jacob Teig did as his first job in 1935-1945: winding the stiff copper cables of hydro electric generators. He was proud of this work and had some tiny 6×6 cm pictures of it. I have it in my blood. This stuff moves me. See the full motor (without the frame and the wheels) here. I discovered this double sided anchored chain, visible through the ice the day before, and the following day brought my camera. I probably would thought about using my mobile if I knew the motive would have been gone by the next day. But I reckoned even the transparent ice would survive. I couldn’t forget it since it was hard avoid thinking about the strong symbolic power of this motive. Press picture for the high resolution version (or should I say “normal resolution”. 960×250 for the headers is not very much..). It’s shot by Dokkhuset at Solsiden here in Trondheim on 16Dec2018. Aside: I wasn’t 100% satisfied with the Panasonic Lumix DMC-LX5 picture presented here. So I brought a newer DMC-LX100 the day after, and even shot in raw format. The picture was technically better, but something had happened with the ice and light. The ice was perhaps more melted and rounded on the edges of the broken-off pieces. And one could barely see the chain below the ice. So I really could not replace the technically best with the dramatically best. These “decoder wires” (as intended to be used inside model trains) each consists of 26 copper strands of diameter ⌀ 0.05 mm. That yields π * (0,05 mm / 2)2 * 26 ≈ 0.05 mm2 area of copper to carry lots of electrons around. Each cable can then deliver about 0.5 Ampere without getting hot. The isolation is PVC, neeeded just like the myelin sheth covering our nerves. Fully assembled each cable has ⌀ 0.6 mm. The picture is taken in 2019, when I discovered these wires. However, the rather complex technology behind a cable like this is quite old – even if my father and colleagues used cotton and oil around the much thicker wires when they made power generators at NEBB in Oslo in the late 1930’ies. Lately I have had to dissect multi-wired cables to find wires half as nice as those pictured. I bought some cardboard (more or less suited), and made the pictured future proofed multi-reel unit. You are at my home page and blog now. New blog notes are here. About comment moderating: Right now I might have disabled it even if it may be enabled in newer notes. The reason for disallowing comments would only be that there is too much spam, also with filter installed. Many of my blogs convey some opinion, and your opinion would be very welcome! So, mail me instead. and I’ll include your comment in the blog. I am also Aclassifier/aclassifier (and real name) on Facebook, Twitter, LinkedIn, Tumblr and Instagram, but that activity is zero to low. I am here. There also is a aclassifier.wordpress.com page, but it only points to here. The Internet Archive / Wayback Machine copy of www.teigfam.net is here – and the older home.no.net is here. Nice visualisation tools of the site map structure are also present there. My real first name is of course Øyvind. Read about it here (Norwegian). I have Vipps and PayPal.me. Standard disclaimer: valid for all blog notes: I have no ads, there’s no money involved, no gifts are accepted. I write what I think is right, and I strive to do it carefully. It’s entirely a hobby with no income of any sort. Just fun. Work disclaimer: Those blog notes and home pages discussing (mostly computer) science- and technology related matter (at http://www.teigfam.net/oyvind and below) do not reveal any product sensitive technical data or technology of my previous employer Autronica Fire and Security (AFS) (I retired in June 2017). In addition, none of what I write about has independent economic value (actual or potential) to AFS. Also, I was not writing on behalf of or at the request of AFS. This entry was posted in About and tagged personal on September 12, 2012 by aclassifier.